Selling your home is no easy task, and unfortunately, depending on the market, it’s a process that could take anywhere from weeks, to months, to even a year. And of course, the longer a listing sits and the more desperate you get, the less you’re going to sell your home for. In reality, it’s often the little things that can really tip a potential buyer in the right direction. Sometimes they need you to show them a home’s potential. If your house is already void of all furniture or is in need of some sprucing up, staging your home properly can be the key between selling it quicker, and for more money, and having it sit on the market for months slowly depleting in price. Unfortunately, hiring a professional stager or opting to rent furniture and accessories can become quite expensive. Instead, try these tips for staging your home so you can sell it for more. If you’ve ever walked into someone else’s home and found wall to wall clutter, you probably noticed that it’s all you can focus on. Whether your house is on the dirtier side, or you simply have a lot of stuff everywhere, working to clean it up can make a huge impact on how your home sells. Plus, you might be able to put a little money back in your pocket by decluttering. Take extra care to make sure everything has its place and looks neat and organized. You’ll ensure that any potential buyer is able to come in and truly see the home in all its glory, and give them the impression that you take care of the things you own, and in translation, your home as well. We often arrange our furniture in ways that serve us best or are most comfortable to our lifestyles, however, that doesn’t mean it’s always the best way to display a room. Take a look at the set-ups in each of your spaces. According to Guenther Management, there is a way to rearrange things to create more space within a room or to help a potential buyer’s eye go to a focal point, consider rearranging. Try to keep from closing off a room. Remove any furniture that seems oversized for the space it’s in. You want people to have the ability to effortlessly walk through your home without feeling like they’re in a maze. If you’ve already or are in the process of moving into a new home, it’s likely your previous home is sans furnishings. Unfortunately, without furniture, it can be difficult for some potential buyers to imagine themselves living in a space. That being said, you don’t have to spend a fortune to stage your home. Instead, ask friends and family for furniture they aren’t using, or hit up garage sales and thrift stores to find inexpensive pieces that can stand in when a buyer comes by. Just remember, you don’t have to go crazy and refurnish the whole place, just include enough items to give a buyer an idea of how they could utilize a space. Have you ever noticed how your home doesn’t feel quite complete without a little greenery? You’d be surprised how effective bringing in the outdoors could do for your home. Add a few plants and flowers throughout the house to cozy the place up and make it feel lived in. If you happen to live by the beach, a great touch can be adding a bowl of shells on the coffee table or including driftwood in your décor. Nature has the ability to soften your home, which is always a good thing in my opinion. Fresh paint can make your home look brand new in no time and it’s not crazy expensive. That’s not to say that you have to repaint every room in your home, as that could get expensive. But you should freshen up areas that look chipped or dingy. Take a good look at doors, trim, and any room that’s gotten plenty of wear. If you see spots that could be touched up, do so. Potential buyers are sure to notice if you don’t. Another great way to use paint is to make a room pop. Consider painting an accent wall somewhere that could enhance a certain room or its features. It could help important features of your home stand out that would be otherwise overlooked. Lighting is a key component to ensuring your home looks its best. Stark, cool toned lights or fluorescence isn’t usually the most flattering of light. It can change the way your paint and floors look. When a potential buyer walks through your home, you want the lighting to be soft and inviting. You also want to ensure that if that person looks in a mirror that the lighting is on the more flattering side. Warmer bulbs are generally more flattering on skin tones, which is why it might be a good idea to invest in some new bulbs. Your home is the place you come to rest your feet at the end of the day. That being said, coziness is key. Small touches throughout your home not only create a cozy atmosphere, but create an idealized picture in a buyer’s head. Bring in a fresh bouquet of flowers, have a bowl of fruit sitting on the counter, have fresh baked cookies sitting on the table, or place a book and tea set on a table by the couch. All these small additions create cozy vignettes that serve to entice the buyer, at no or low-cost to you. Staging your home properly can be the key to having your home sold before you know it. That being said, you don’t have to enlist or pay for a professional to get the job done. By paying attention to the little details and utilizing a few of these tips, you can inexpensively stage your home. Ultimately helping you sell it for more. 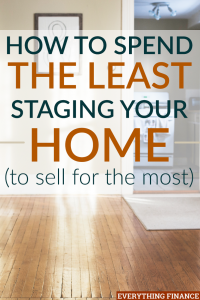 Have you ever staged a home? What are some of rooms or details you focused on? Seller financing, good idea or bad? Home Truths: Buy, Rent … Or Live In A Tent?